Background: Many people, especially in developing countries such as Ethiopia, are migrating to cities. The majority of these people have settled in slum areas, which often have poor sanitation and housing conditions. Therefore, this study was conducted to gather evidence on nutritional status and associated factors among children aged 6–59 months living in slum areas of Gondar city, northwest Ethiopia. Methods: A community-based cross-sectional study was carried out from 3 to 28 May 2017. A total of 593 children from the slum areas aged 6–59 months were included in the study. Bivariable and multivariable logistic regression analyses were carried out to identify the independent determinants of stunting and wasting. Results: The overall prevalences of stunting and wasting were 42.3% (95% CI 38.34, 46.3%) and 7.3% (95% CI 5.3, 9.4%), respectively. Poor wealth status (adjusted odds ratio [AOR] =1.79; 95% CI 1.19, 2.70) and age of child 24–35 months (AOR=2.56; 95% CI 1.32, 4.96), 36–47 months (AOR=2.27; 95% CI 1.14, 4.54) and 48–59 months (AOR=2.69; 95% CI 1.35, 5.32) were independently associated with stunting. Similarly, presence of a fever in the previous 2 weeks (AOR=2.29; 95% CI 1.20, 4.38) and paternal control over resources (AOR=3.66; 95% CI 1.12, 11.04) were associated with wasting. Children of uneducated mothers (AOR=3.30; 95% CI 1.29, 8.46) were also more likely to be wasted. Conclusion: This study illustrates that undernutrition is prevalent in the slum areas of Gondar city and is a critical public health problem. Therefore, attention should be targeted at economically disadvantaged children living in slum areas. In addition, there is a need to improve medical awareness of families with young children in these areas and increase the health-seeking behavior of these families, primarily by focusing on maternal education. Increasing women’s decision-making autonomy over household resources is also recommended to address the problem. The Government of Ethiopia has endorsed a National Nutrition Program and child feeding strategy with special focus on infant and young child nutritional practices. Currently in Ethiopia, especially in the Amhara region, a huge number of under-fives (46%) are suffering from undernutrition and its complications.4,5 There is a dearth of evidence on the nutritional status of under-fives in slum areas of Ethiopia, with the majority of previous local studies focused predominantly on rural areas.5,22–24 Many people, especially in developing countries such as Ethiopia, are migrating to cities and the majority of these settle in slum areas, neglected parts of the city with very limited basic services.25 The slums normally have poor housing conditions and poor sanitation, and the inhabitants are from lower socio-economic classes, which directly impacts on food security.26 Hence, the evidence gathered from this study is useful to all stakeholders of interventions involved in control of undernutrition. The information is also appropriate in policy, planning and decision making at the local as well as the national level. Therefore, this study was conducted to gather evidence on nutritional status and associated factors among children aged 6–59 months living in slum areas of Gondar city, in northwest Ethiopia. In the slum areas of Gondar city, the prevalence of undernutrition is high and it is a critical public health problem. A community-based cross-sectional study was carried out from 3 to 28 May 2017 in the slum areas of Gondar City. Gondar is located in North Gondar Administrative Zone, which is 750 km from Addis Ababa, the capital of Ethiopia. According to the recent administration system, the city has 12 sub-cities. The city administration identified three slum areas. The total estimated population of the city is 264,964. All children aged 6–59 months who lived in any of the three slum areas of Gondar city were included in the survey. The sample size was computed using a single proportion formula considering the following assumptions: a prevalence of stunting in Amhara region of 46%,5 a 95% level of confidence and a 5% margin of error. A 10% non-response rate was also added to achieve a minimum sample size of 420. However, according to the city administration, the total number of children aged 6–59 months living in the three slum areas of the city was 600. Thus, to increase the power of the study, all children (593) fulfilling the inclusion criteria were included in the study. A structured interviewer-administered questionnaire composed of questions on socio-demographic factors, maternal and child health care, food security, hygiene and sanitation was used to collect the data. The questionnaire was administered via house-to-house visits. The questionnaire was prepared in English and translated into the local language, Amharic, and then translated back into English to check the consistency. Six diploma nurse data collectors and three BSc field supervisors participated in the data collection. Anthropometric measurements of both weight and length/height were carried out using the procedure stipulated by the World Health Organization (WHO) (2006).27 The weight of children aged 6–23 months was measured by a hanging scale (serial number 3541317009, with graduation of 0.1 kg and measuring up to 20 kg; Seca, Hamburg, Germany) to the nearest 0.1 kg with light clothing and no shoes. Similarly, the weight of children aged 24–59 months was measured by the Seca digital balance (serial number 5755107131646, with graduation of 0.1 kg and measuring up to 160 kg). The instrument was calibrated before weighing each child and by setting it to zero. Furthermore, the weighing scale was checked daily against the standard weight for accuracy. The length of a child (aged 6–23 months) was measured using a horizontal wooden length board in a recumbent position and length was read to the nearest 0.1 cm. Height was measured using the Seca vertical height scale (model number 213) following the standard procedure. The occipital (back of the head), shoulder blades, buttocks and heels were touching the measuring board and height was recorded to the nearest 0.01cm. Two days training on the technique of interviewing and anthropometric measurements was given for data collectors and supervisors. Then the tool was pretested in 5% of the sample size in the study area. Necessary modifications were made, such as identifying and replacing ambiguous words. During data collection, close supervision, spot-checking and reviewing the completed questionnaire were undertaken by the supervisors and principal investigator on a daily basis. Data clean-up and cross-checking were carried out before analysis. Data were edited, coded and entered into Epi Info version 7, and exported to SPSS version 20 for analysis. Descriptive statistics (means, frequencies and proportions) were used to present the findings. A bivariable analysis was conducted for stunting and wasting separately. Variables with P-values of <0.2 in the bivariable analysis were entered into a multivariable logistic regression analysis to identify the independent predictors of stunting and wasting. Both the crude odds ratio (COR) and adjusted odds ratio (AOR) with corresponding 95% CI were computed to show the strength of the association. A Hosmer–Lemeshow goodness-of-fit test was checked (P=0.9 for stunting and P=0.6 for wasting). Variables with a P-value of <0.05 in the multivariate logistic regression analysis were taken as statistically significant. A total of 593 mother/caregiver–child pairs were included in the study. The mean ± SD age of the children was 31.06±15.08 months. More than two-thirds (73.9%) of mothers were married and were Orthodox Christian (68.6%). About 61.4% of mothers were unemployed and 33.7% had no formal education (Table 1). The majority of the mothers (93.8%) had received antenatal care during pregnancy. All children were breastfed (100%) and almost all were vaccinated (97.5%). The majority had received deworming (57.8%) and vitamin A supplementation (82.1%) in the previous 6 months. However, over a quarter (27%) had a history of diarrhea and 27.8% of children had had a fever within the 2 weeks before the date of the survey. More than three-quarters (78.6%) of children had started breastfeeding within 1 hour of birth. Most children (70.3%) received complementary feeding at the age of 6 months, but more than half (60.1%) had an unvaried diet. Regarding the availability of latrines and food security, around one-quarter (26%) of households had no latrine and 40.6% did not have a secure food supply. Out of 593 children, 42.3% (95% CI 38.34, 46.3%) and 7.3% (95% CI 5.3, 9.4%) were stunted and wasted, respectively. 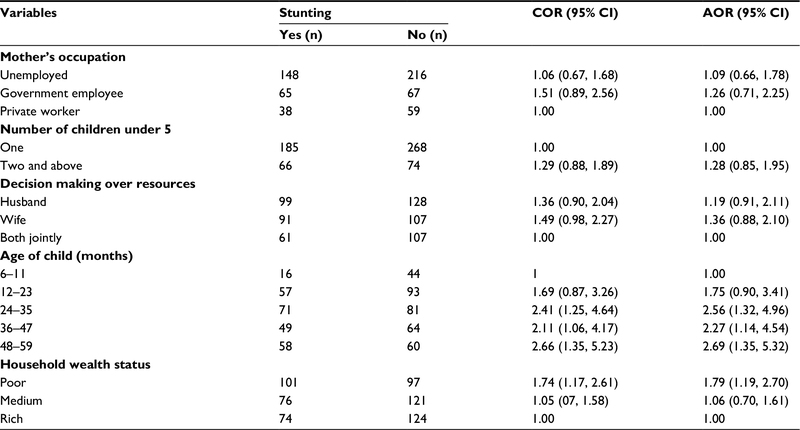 About 15.9% of children surveyed were severely stunted (Table 2). In the bivariable analysis, mother’s occupation, number of under-fives, decision making over resources, the age of the children and low household wealth were associated with stunting. The age of the children and household wealth status remained significantly associated with stunting in the multivariable logistic regression analysis. Thus, higher proportions of children are stunted in households with poor socio-economic status (AOR=1.79; 95% CI 1.19, 2.70). Likewise, higher odds of stunting were observed in higher age groups, 24–35 months (AOR=2.56; 95% CI 1.32, 4.96), 36–47 months (AOR=2.27; 95% CI 1.14, 4.54) and 48–59 months (AOR=2.69; 95% CI 1.35, 5.32) (Table 3). Abbreviations: COR, crude odds ratio; AOR, adjusted odds ratio. As presented in Table 4, fever in 2 weeks before the date of the survey, maternal education and paternal control over resources were significantly associated with wasting. Accordingly, a higher odds of wasting was observed among children who had fever (AOR=2.29; 95% CI 1.20, 4.38), children of uneducated mothers (AOR=3.30; 95% CI 1.29, 8.46) and children whose fathers controlled the resources at home (AOR=3.66; 95% CI 1.12, 11.04). Abbreviations: COR, crude odds ratio; AOR, adjusted odds ratio; ANC, antenatal care. Despite various interventions to alleviate childhood undernutrition in Ethiopia, the current study found that the prevalence of stunting and wasting remains unacceptably high. Using the WHO cut-off point for declaring the public health importance of undernutrition, the study found that stunting was a critical health problem, with a prevalence of 42.3%, and wasting was a medium public health problem, with a prevalence of 7.3% among the children inhabiting the slums of Gondar city.31 This indicates that a considerable number of children suffered from the consequences of undernutrition. The findings should stimulate the concerned body to develop new initiatives and investments and to strengthen existing interventions to decrease the burden of undernutrition. In this study, the prevalence of wasting, 7.3%, was consistent with findings of studies conducted in slum areas of Ethiopia (6.4%),12 Iran (8.19%)33 and Botswana (5.5%).36 However, the prevalence of wasting in the present study was higher than that reported in Kenya (2.6%).14 The high prevalence of wasting may be due to the mothers’ low educational levels as well as differences in design between studies. The study was conducted by including all children in the study area. However, the study has some limitations. First, the study did not consider the quantity and quality of food consumed by the children. Second, the study may not free from social desirability bias in responding to questions on the type and frequency of foods given to children. The study confirmed the critical nature of undernutrition as a public health problem in the slum areas of Gondar city. The age of the children and poor household wealth status were associated with stunting. Similarly, lack of maternal education, fever in the 2 weeks preceding the interview and paternal control over household resources were associated with wasting. Therefore, attention should be targeted to economically disadvantaged children living in the slum areas. In addition, health education and education on health-seeking behavior regarding sick children, focusing on maternal education and increasing women’s decision-making autonomy over household resources are recommended to address the problem. Ethical approval for this study was obtained from the Institutional Review Board of the University of Gondar, who also approved the use of verbal informed consent from the parents/caretakers. A permission letter was also obtained from Gondar city administration. Verbal consent was obtained from the parent/caretaker of each study participant after the purpose of the study had been explained. The authors would like to thank study participants for their willingness to participate in the study, and the University of Gondar and Gondar City Health Department for material support. Finally, we would like to thank Mr Joe Kennedy for language editing. No funding was secured for this study. AG, TD and ZA conceived the study, developed the tool, coordinated data collection, carried out the statistical analysis and drafted the manuscript. ME, AG, ZA and TD participated in the design of the study, developed the tool, participated in the statistical analysis and drafted the manuscript. All authors read and approved the final manuscript. World Health Organization/UNICEF. WHO Child Growth Standards and the Identification of Severe Acute Malnutrition in Infants and Children: A Joint Statement by the World Health Organization and the United Nations Children’s Fund. Geneva: World Health Organization; 2009. Pollitt E, Gorman KS, Engle PL, Martorell R, Rivera J. Early supplementary feeding and cognition: effects over two decades. Monogr Soc Res Child Dev. 1993;58(7):1–99; discussion 111–118. Grantham-Mcgregor S, Cheung YB, Cueto S, et al. Developmental potential in the first 5 years for children in developing countries. Lancet. 2007;369(9555):60–70. UNICEF. The Cost of Hunger in Ethiopia. The Social and Economic Impact of Child Undernourishment in Ethiopia. Summary Report. Addis Ababa: UNICEF; 2014. Central Statistical Agency [Ethiopia] and ICF International. Ethiopia Demographic and Health Survey 2011. Addis Ababa/Calverton, MD: Central Statistical Agency/ICF International; 2016. Ramji S. Impact of infant & young child feeding & caring practices on nutritional status & health. Indian J Med Res. 2009;130(5):624–626. Awasthi S, Agarwal S. Determinants of childhood mortality and morbidity in urban slums in India. Indian Pediatr. 2003;40(12):1145–1160. Goudet SM, Griffiths PL, Bogin BA, Madise NJ, Cochrane Public Health Group. Nutritional interventions for preventing stunting in children (0 to 5 years) living in urban slums. Cochrane Database Syst Rev. 2015;(5):CD011695. Unger A. Children’s health in slum settings. Arch Dis Child. 2013;98(10):799–805. UN-HABITAT. Defining Slums: Towards an Operational Definition for Measuring Slums. Background Paper 2, Expert Group Meeting on Slum Indicators. Nairobi: United Nations; 2002. Moya J, Bearer CF, Etzel RA. Children’s behavior and physiology and how it affects exposure to environmental contaminants. Pediatrics. 2004;113(4 Suppl):996–1006. Demilew YM, Abie DD. Undernutrition and associated factors among 24-36-month-old children in slum areas of Bahir Dar city, Ethiopia. Int J Gen Med. 2017;10:79–86. Ahsan KZ, Arifeen SE, Al-Mamun MA, Khan SH, Chakraborty N. Effects of individual, household and community characteristics on child nutritional status in the slums of urban Bangladesh. Arch Public Health. 2017;75(9):9. Olack B, Burke H, Cosmas L, et al. 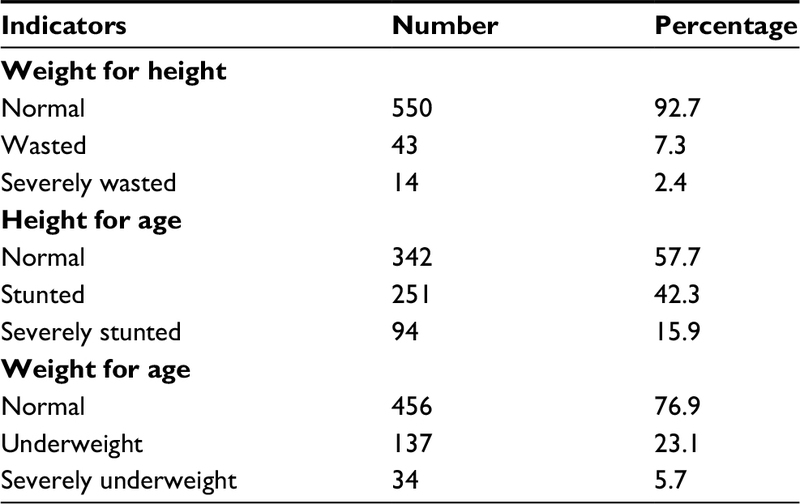 Nutritional status of under-five children living in an informal urban settlement in Nairobi, Kenya. J Health Popul Nutr. 2011;29(4):357–363. Dhok R, Thakre S. Chronic undernutrition amongst under-five in an urban slum of Central India. Int J Community Med Public Health. 2016;3(3):700–704. Onsa ZO, Ahmed NMK. Impact of Exclusive Breast Feeding on the Growth of Sudanese Children (0-24 Months). Pak J Nutr. 2014;13(2):99–106. Engle PL, Menon P, Haddad L. Care and Nutrition: Concepts and Measurement. World Dev. 1999;27(8):1309–1337. Bantamen G, Belaynew W, Dube J. Assessment of factors associated with malnutrition among under five years age children at Machakel Woreda, Northwest Ethiopia: a case control study. J Nutr Food Sci. 2014;4(1):256. Ayana AB, Hailemariam TW, Melke AS. Determinants of acute malnutrition among children aged 6–59 months in Public Hospitals, Oromia region, West Ethiopia: a case–control study. BMC Nutr. 2015;1(1):34. Gebretsadik A, Worku A, Berhane Y, et al. Factors associated with acute respiratory infection in children under the age of 5 years: evidence from the 2011 Ethiopia demographic and health survey. Neuropsychiatr Dis Treat. 2015;11:2159–2175. Tariku B, Mulugeta A, Tsadik M, Azene G. Prevalence and Risk Factors of Child Malnutrition in Community Based Nutrition Program Implementing and Nonimplementing Districts from South East Amhara, Ethiopia. OAlib. 2014;01(03):1–17. Asfaw M, Wondaferash M, Taha M, Dube L. Prevalence of undernutrition and associated factors among children aged between six to fifty nine months in Bule Hora district, South Ethiopia. BMC Public Health. 2015;15(1):41. Fikadu T, Assegid S, Dube L. Factors associated with stunting among children of age 24 to 59 months in Meskan district, Gurage Zone, South Ethiopia: a case-control study. BMC Public Health. 2014;14(1):800. Tariku A, Woldie H, Fekadu A, Adane AA, Ferede AT, Yitayew S. Nearly half of preschool children are stunted in Dembia district, Northwest Ethiopia: a community based cross-sectional study. Arch Public Health. 2016;74(1):13. Akter T. Migration and Living Conditions in Urban Slums: Implications for Food Security. Dhaka: Unnayan Onneshan; 2009. Rahman MK, Muhibbullah M, Islam MS. Socio-economic status of slum dwellers: a case study of Uttara periphery, Dhaka.. Asian Review: Journal of Asian University of Bangladesh. 2015;4(1):14–27. World Health Organization. Who Child Growth Standards: Length/Height for Age, Weight-for-Age, Weight-for-Length, Weight-for-Height And Body Mass Index-for-Age, Methods and Development. Geneva: World Health Organization; 2006. Coates J, Swindale A, Bilinsky P. Household Food Insecurity Access Scale (HFIAS) for Measurement of Food Access: Indicator Guide. Washington, DC: Food and Nutrition Technical Assistance Project, Academy for Educational Development; 2007. Kennedy GL, Pedro MR, Seghieri C, Nantel G, Brouwer I. Dietary diversity score is a useful indicator of micronutrient intake in non-breast-feeding Filipino children. J Nutr. 2007;137(2):472–477. Abebe Z, Gebeye E, Tariku A. Poor dietary diversity, wealth status and use of un-iodized salt are associated with goiter among school children: a cross-sectional study in Ethiopia. BMC Public Health. 2017;17(1):44. World Health Organization. Nutrition Landscape Information System (NLIS) Country Profile Indicators: Interpretation Guide. Geneva: World Health Organization; 2010. Rahman L, Miah ZI, Biswas H, et al. Maternal Factors Causing Under-Nutrition among the under-Five Slum Children in Dhaka City. Med Col J. 2013;6(1):92–96. Kavosi E, Hassanzadeh Rostami Z, Nasihatkon A, et al. Prevalence and Determinants of Under-Nutrition Among Children Under Six: a Cross-Sectional Survey in Fars Province, Iran. Int J Health Policy Manag. 2014;3(2):71–76. Mukherjee K. Malnutrition in under five children in Turbhe stores urban slums in Navi Mumbai. Int J Med Sci Public Health. 2014;3(9):1127–1131. Brhane G, Regassa N. Nutritional status of children under five years of age in Shire Indaselassie, North Ethiopia: Examining the prevalence and risk factors. Kontakt. 2014;16:161–170. Nnyepi M, Bandeke T, Mahgoub S. Factors affecting prevalence of malnutrition among children under three years of age in Botswana. Afr J Food Agric Nutr Dev. 2006;6(1):1–15. Sengupta P, Philip N, Benjamin AI. Epidemiological correlates of under-nutrition in under-5 years children in an urban slum of Ludhiana. HPPI. 2010;33(1):1–9. Ricci JA, Becker S. Risk factors for wasting and stunting among children in Metro Cebu, Philippines. Am J Clin Nutr. 1996;63(6):966–975. Fentahun W, Wubshet M, Tariku A. Undernutrition and associated factors among children aged 6-59 months in East Belesa District, northwest Ethiopia: a community based cross-sectional study. BMC Public Health. 2016;16:506. Rahman MM, Saima U, Goni MA. Impact of Maternal Household Decision-Making Autonomy on Child Nutritional Status in Bangladesh. Asia Pac J Public Health. 2015;27(5):509–520. Derso T, Tariku A, Biks GA, Wassie MM. Stunting, wasting and associated factors among children aged 6-24months in Dabat health and demographic surveillance system site: A community based cross-sectional study in Ethiopia. BMC Pediatr. 2017;17(1):96. UNICEF. Strategy for Improved Nutrition of Women and Children in Developing Countries. A UNICEF Policy Review. New York: UNICEF; 1990. Belew AK, Ali BM, Abebe Z, Dachew BA. Dietary diversity and meal frequency among infant and young children: a community based study. Ital J Pediatr. 2017;43(1):73. Scrimshaw NS. Effect of infection on nutritional status. Proc Natl Sci Counc Repub China B. 1992;16(1):46–64. Gabriela M, Marón A, Clará W, et al. Association between nutritional status and severity of dengue infection in children in El Salvador. Am J Trop Med Hyg. 2010;82(2):324–329. Panigrahi A, Das SC. Undernutrition and its correlates among children of 3-9 years of age residing in slum areas of Bhubaneswar, India. Sci World J. 2014;2014:1–9.